I’m a bit late to report this due to the holidays, but Labelscar received a very high-profile mention in the last issue of The Economist, which just leapt off of newsstands. Sorry about that one! Sweet! I love that this site is getting more recognition. Any chance of covering Square One Mall in Saugus, MA or The Cambridgeside Galleria in Cambridge MA anytime soon? How about the old Layfayette Plaza from Boston? Interesting article. I thought the author rushed into reciting the rosary for the shopping mall. News of their death are greatly exaggerated. Anyway, kudos to you for being mentioned. I wonder why he didn’t mention Keith’s site, too? After all, Deadmalls.com hasn’t changed in 4 years! Outside of some commentaries. Excellent article and kudos to you for the shout-out. Now that it’s gone radio silence over at mallsofamerica.com, you’re pretty much the only game in town! Keep on keeping on! Yeah, the reason MOA got snubbed was because it’s gone dead, the comments are littered with spam, and it was primarily to focus on old mall postcards. However, Mall Hall of Fame deserved a mention. It’s also quite disheartening when the last section of the article becomes a plug for lifestyle centers. Know how to save the mall? Kill the kiosks. The recognition for this site is well-deserved. You guys do an excellent job of keeping the history of North American shopping centers relevant to people all over the world. As for the mention of DeadMalls and the omission of Malls Of America, I think it comes down to this: DM was the first popular site of its kind and set the bar high. MOA is a wonderful site as well, but its a little less personal and doesn’t dig into the histories of specific malls as much. 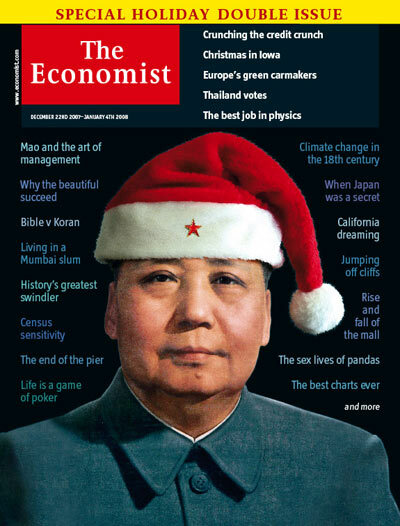 Anyway, did anyone notice Chairman Mao on the cover with the Macy’s hat? Just kidding. Interesting article, but I feel it was too patronizing towards Mr. Caruso near the end. I realize, however, it was comparing and contrasting his visions on building ‘lifestyle centers’ to Mr. Gruen’s visions when he designed indoor malls, due to the fact that they’re a popular trend among newer shopping centers being built at the moment. I also like how the article cited the tribute site for Lakehurst Mall in Waukegan, IL. Second Jonah 100% about mall kiosks! Especially since I always thought it was strange that such stores were allowed to be located in the middle of mall hallways, and not by subdividing existing retail spaces into spaces big enough for kiosk-like stores to operate. I realize that at some of the super-successful malls where mall occupancy is high, such an idea may not work, but it’d sure make it easier to ignore the kiosk-like stores in malls. Not to mention, relocating the kiosk stores away from the hallways, and into the side of mall hallways could possibly make dying/declining malls more attractive to perspective businesses to locate inside(plus in slow malls, would even give such kiosk businesses extra space to operate out of! ), rather than furthering the unattractive image of such malls to possible businesses considering where to locate their store(s). Funny no mention of one of the region’s 1st premier ‘lifestyle’ outdoor centers- Garden City (Center) in Cranston, Rhode Island. Been here since the 50’s? and nearly forgotten by the newer Rhode Island (Midland) Mall, Warwick Mall, Emerald Square and Providence Place. Quite a few higher end retailers have located here. And together with the new development across the street at the old Sockanossett Training School (Chapel View Center) another lifestyle center……what will happen to the Old Garden City? Actually, Country Club Plaza in Kansas City and Shaker Square in Cleveland (which date from the late 20s) could probably be considered prototypes for the modern lifestyle center. It’s interesting, though. Unlike DeadMalls.com, Labelscar tries to widen the scope, it’s not just why some malls died and ultimately redeveloped, but why some are wildly successful. DeadMalls.com features little places like Salisbury Mall, Indian Mall, Metcalf South Shopping Center, and Summit Place Mall…the little outmoded dead malls. But also huge mega-malls like Mall of America, Carousel Center, Natick Collection, and Cherry Hill Mall…ones that killed other malls, or just lived life and thrived and survived. That’s what makes Labelscar unique.